« Can-Am Renegade Rear Rack Can-Am Red – Free Shipping! NEW PRODUCT!! 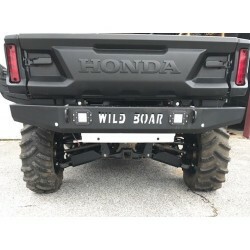 Get your Wild Boar Pioneer Rear Bumper with flush mount lights TODAY!! Great price at $299.00 with FREE SHIPPING!! The Honda Pioneer is one of the best machines on the market right now. It’s tough, it’s dependable, and we wanted our bumper to match it’s strength. The Wild Boar Rear Bumper for the Honda Pioneer 1000 offers the best protection you’re going to find. We designed this bumper so that you will still be able to dump your bed. Our bumpers are proudly made in the USA and come with LED flush mount cubes for a little extra light to help you see at night. Don’t forget to check out our matching front bumper! Also don’t forget to check out the other products that are available for this bike! Pioneer Wake Tower , Pioneer Front Bumper with lights, WINCHES, LEDS & ACCESSORIES! Call Us at 850-912-4350 or Order Online.